Anne Boleyn’s younger brother, George, was married to Jane Parker for over ten years. However, they never had children of their own. Often in Historical Fiction, one of the reasons why their marriage is viewed as an unhappy one is due to the lack of children produced. However, was it true that the couple never had children? 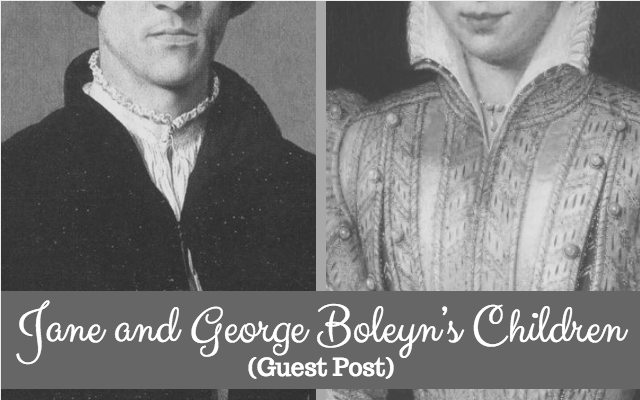 There have been several people linked to George Boleyn, raising the question of whether he may have had an illegitimate heir. It may be possible that he had an illegitimate son who grew up in Ireland away from the English court. 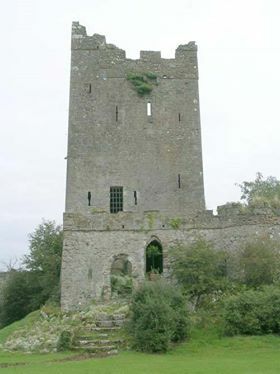 At Clonony Castle, Ireland, the remains of two bodies were found in the early 19th century. It is believed that these were the great granddaughters of George, Elizabeth and Mary Boleyn. Clonony Castle had originally been given to the Henry VIII by John Og MacCoghlan. The castle was then given to Thomas Boleyn. According to the story, after George’s execution, his illegitimate son was moved to Clonony for safety. Therefore, Elizabeth and Mary were descended from this young boy. The tomb slab was discovered by labourers who were gathering stone for building work near the castle, in 1803. They found a cave about hundred yards from the castle. In the cave they found a coffin cut in the Limestone rock, which contained the two bodies. The slab was referred to locally as the monument of “Queen Elizabeth’s cousins”. At the time of the discovery, the Earl of Rosse, a descendant of Alice, daughter of Sir William Boleyn of Blickling, showed paintings to a journalist of two unknown, young women at Birr Castle. The paintings were marked to indicate that the girls were 18 and 19 years old when they were painted in 1567. The Earl suggested that these two young women in the portrait were Elizabeth and Mary Boleyn and were hence the girls found in the tomb. However, it is believed that they are actually linked to the Boleyn family via the Clere family. Therefore, it’s possible that the girls were in fact Margaret and Elizabeth Clere, born in 1548 and 1547, daughters of John Clere of Ormesby St. Margaret, Norfolk. He was son of Robert Clere and Alice Boleyn, Anne’s aunt. George Boleyn, who was Dean of Lichfield from 1576 up to his death in 1603, has also been linked to Anne’s brother, George, as his son, either by Jane Parker, or illegitimately. The Dean referred to himself as a kinsman of the Carey and Knollys family, who were both families linked to Mary Boleyn. In 1597, George Carey, 2nd Baron Hunsdon and Mary Boleyn’s grandson, sent a letter to Lord Burghley asking for advice petitioning Elizabeth I, concerning the earldom of Ormond. This earldom had once been held by his great-grandfather, Thomas Boleyn, so Hunsdon’s claim was that he believed that the title should have been handed down to his father and then, to himself because of their connection to Thomas’ eldest daughter, Mary Boleyn. So, if George Boleyn, Dean of Lichfield, was in fact George Boleyn’s son, wouldn’t it have been the case that he should have petitioned about his claim to the title instead of George Carey? However, this issue was not raised at the time, so adding doubt to whether he was George Boleyn’s son. In the end, Thomas Boleyn passed on the ancestral claim to the St Leger branch of the family – because his son, George Boleyn, had died without a son. Therefore, if the Dean was George’s son, there’s no doubt that he would have inherited it. Even if the Dean was illegitimate, it would have still been expected that he would have been looked after in some way and recognised by the surviving Boleyn relatives. If George Boleyn did have an illegitimate son, there would have been no reason for him not to recognise him, especially as he had no legitimate heirs with Jane. Even though it seems unlikely that Jane and George had children of their own, one thing we do definitely know is that in April 1533, Jane and George were granted wardship of twelve year old Edmund Sheffield. This was probably the nearest they experienced to some kind of parenthood. Edmund was a distant relation of the King and being granted his wardship was a reward from the King to Jane and George for their loyalty to him. Edmund was the son of Sir Robert Sheffield and his wife, Jane Stanley, who was the daughter of George Stanley, Lord Strange. His father had died in 1531 and Edmund would be the heir to his father’s land in Nottinghamshire and Lincolnshire. Not only was this wardship a reward for their loyalty to the King, but it also meant if Jane and George did have a girl, Edmund could be a potential husband for her. As George’s wife, it would have been Jane’s duty to produce an “heir”. Therefore, for Jane to be married to George for that long and still not have at least one child, this would have been seen as very odd by 16th century standards. Unfortunately, there are no records of miscarriages and we can’t rule out the possibility that either or both Jane and George may have suffered from fertility problems. Even though there are no records of Jane having miscarriages, this doesn’t mean they didn’t happen. It is possible that Jane maybe did eventually fall pregnant. However, as there are no records of Jane having children with George, if Jane did fall pregnant, unfortunately the children were not carried to full term. The question on whether George and Jane did have children of their own is definitely still a much debated area. The gaps in what we know so far, have been filled in by Historical Fiction and in most cases, this has not necessarily been a good thing, as it has on its own helped to fuel the idea their marriage was an unhappy one. “Jane Boleyn: The Infamous Lady Rochford” – Julia Fox, Phoenix, 2007. Visit my pages at https://www.facebook.com/TheLadyRochfordSaga and at http://danielleliannem.wix.com/janeboleyn .